Columbus the bulldog LOVES the rain! His favorite place to be in the rain…is on a hammock! How did he decide that this specific hammock was his favorite place to play? I have no idea, but I love watching him! 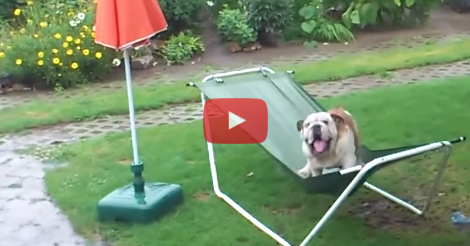 The very large bulldog has trouble jumping onto the hammock, but he perseveres with all of his strength. The hammock tips back and forth, but that doesn’t stop him! He’s got rain to…eat? Nibble? I’m not really sure exactly what he’s doing, but he’s super cute while he’s doing it! My dogs will do just about anything to escape the rain, they hate it as much as they hate taking baths. Maybe your dog needs to love water in order to love playing in the rain? Regardless, this bulldog is a riot and I can’t stop watching him! He is so excited but his poor body can’t seem to catch up. I’ve never been around bulldogs so I’m not sure how they are supposed to act, but this one seems a bit on the chunky side to me. Am I wrong? Well if he is, he’s getting a totally fun workout just from playing in this drizzling down pour! I hope his owners let him outside every time it rains from now on!